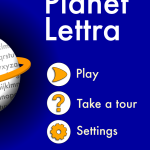 In designing the interface to the first version of Planet Lettra, one of my main goals was to ensure that young users would not get stuck in any submenus or windows that were not part of the main play experience. I’ve since learned that even very young users are very comfortable navigating a standard app interface. 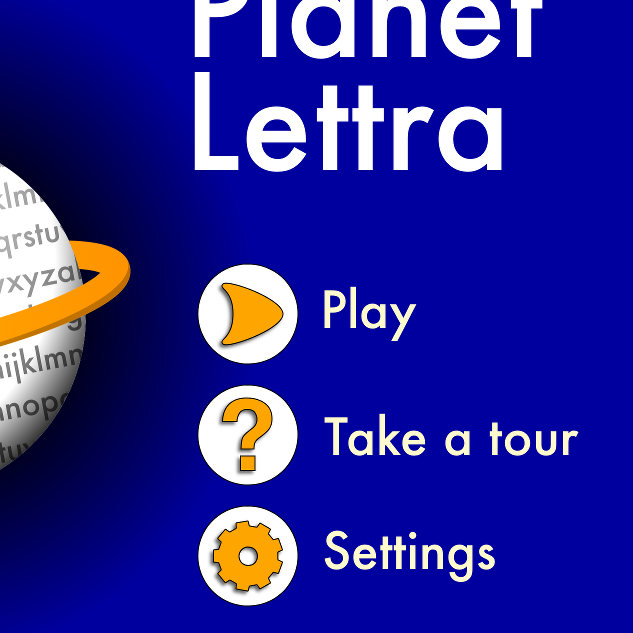 On the other hand, feedback from parents made it clear that settings are best put in the app rather than in the iPad or iPhone Settings pane; many users had trouble figuring out how to change the language of Planet Lettra. A number of other important controls and features were hard to discover, like the fact that the planet spins and that the letter in single-letter balls can be changed by dragging them near a certain item on the planet surface. To address these issues, in Version 2, I’ve added a home screen with “Settings” and “Guided Tour” buttons as well as a play button. I have struggled with the guided tour: should it be text and voice over or purely images? should it be a tutorial video or use illustration or animation? I wanted it to be brief (about 3 minutes), fun and understandable to users of any reading level. I made some illustrations (watercolour and India ink), which was fun, but in the end, I’m making the video using footage from the game itself. I really hope this feature, the “Guided Tour”, will improve the user’s experience of Planet Lettra, because it has taken a lot of time (especially compared to the single page of text that was all the help available in Version 1) and isn’t finished yet. At least I’ve been having some fun making it (writing, illustrating, figuring out how to get an acceptable voice over recording with my existing equipment and space)!